Laser hair removal continues to be one of our most popular services at Skin RN. If you’re considering laser hair removal, there’s a few things you should know before getting a treatment. 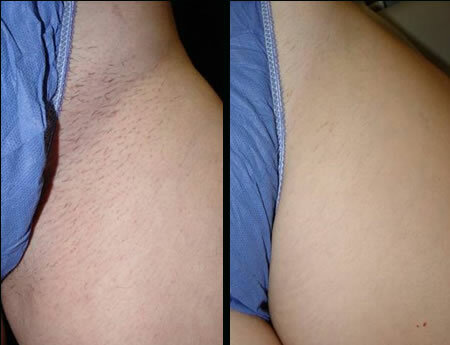 Laser hair removal uses an intense pulsating beam of light to remove unwanted hair. Advanced hair removal devices use an electronic “eye” to target hair follicles before delivering a light pulse which damages the follicle and inhibits future growth. Since laser hair removal has grown increasingly popular, new manufacturers have flooded the market with treatment devices. Unfortunately, this rapid rate of new technologies has resulted in an increasing number of inferior devices. The FDA has recently reported that they are no longer able to evaluate every device that becomes available, leaving it up to consumers to fully research the devices used by their treatment providers in order to make an informed decision. Additionally, laser treatment centers have grown in popularity since the cost of these inferior devices is negligible compared to FDA approved medical hair removal devices. A quick search online reveals hundreds of laser treatment centers all over the United States, and a more in-depth search will reveal a growing number of class action lawsuits against these companies and the manufactures of their devices. If you remember from above, laser hair removal devices work by emitting an intense beam of light. This light is measured by it’s wavelength. The secret to effective hair removal is matching the proper wavelength to the patient’s skin tone as lighter skin tones require lower wavelengths and darker skin tones require higher wavelengths. At Skin RN, we use multiple devices with wavelengths starting at 770 and reaching up to 1064. This allows us to effectively treat all skin types. Before we ever do a laser hair removal treatment at Skin RN Aesthetics, we always make sure that we can do a good job with the devices we have. And in 90% of the cases, we can… but there are still times when it’s just not possible to get a good result for certain skin type and hair color combination’s--specifically for people with very dark skin or very fine hair. In these cases, we’ll do a test spot to see if the treatment is going be to effective before moving forward. The reason it’s important to understand your skin type is because different lasers are used to treat different skin types. Before you choose to get laser hair removal, it’s important to determine if your treatment provider is using a device that will work effectively for your skin type. Six different skin types are distinguished using the Fitzpatrick Scale, also known as the Fitzpatrick skin typing test. At Skin RN, we use multiple FDA approved devices to effectively treat all six skin types. Level 2 – Light, fair, or light-skinned European. Tends to have light colored or red hair. Tanning can be a challenge. Level 3 – Beige, light-intermediate, or dark-skinned European. Any hair or eye color. Rarely burns, gradually tans. Level 4 – Beige with a brown tint, also known as “Mediterranean” or “olive skin.” Dark brown to black hair and dark eyes. Rarely burns and easily tans. Level 5 – Brown, dark brown, or hispanic. Black hair and brown or hazel eyes. Tans every easily. Level 6 – Very dark, or “black.” Black hair with dark brown eyes with minor variations. Never burns in the sun, or tans very easily. Since we’ve treated thousands of patients, we’ll help you determine your skin type during a free consultation to make sure you get the very best results from laser hair removal. *Package of 6 includes up to two free touch ups within one year post treatment. Additional touch ups after completing package are 50% off of individual area pricing. *Get an additional 10% off of your total when you purchase more than one package (may not be combined with any other Laser Hair Removal offer).